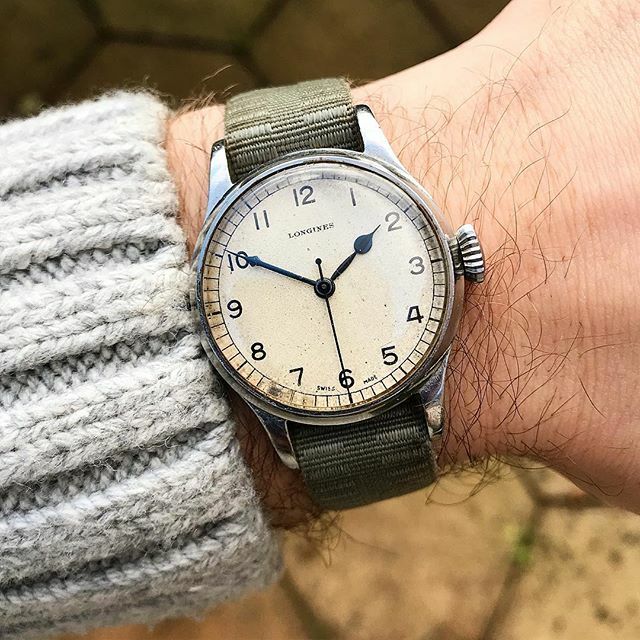 The on wrist shot in question was posted by @jonbues from HODINKEE and I’ll be honest, At first, I couldn’t tell whether it was a genuine vintage piece (despite the caption heavily hinting it wasn't) or it was a new Longines model. Thankfully, for all watch enthusiasts everywhere (slight exaggeration maybe?) 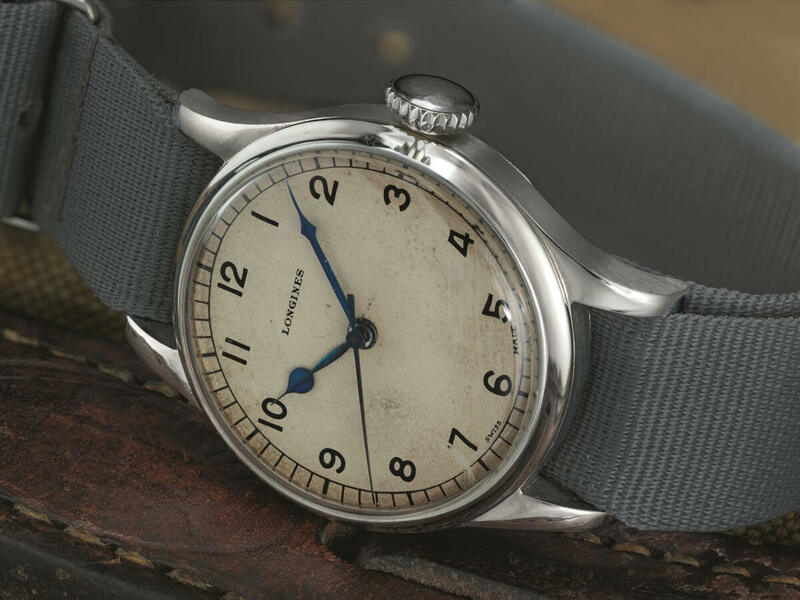 the watch was a genuinely new piece from Longines with an aimed release of later this year. First I should go over the dimensions of this beauty, as for me, this was one of the most important things for me to find out. So many times companies re-issue or release models inspired by older ones and then ruin the watch with it's new over the top 43mm size (personal preference of course!). The Longines Military Watch has a 38.5mm case width with a thickness that can’t be much more than 12mm. Effectively, it's a perfect size. 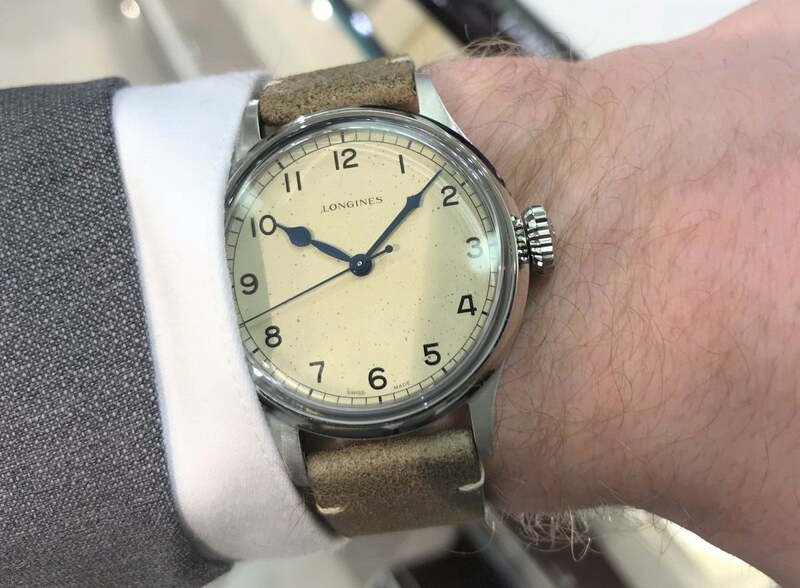 Longines needed to bump the size up from the original for today's market, but luckily they didn't go over the top and stuck with a >40mm case size. 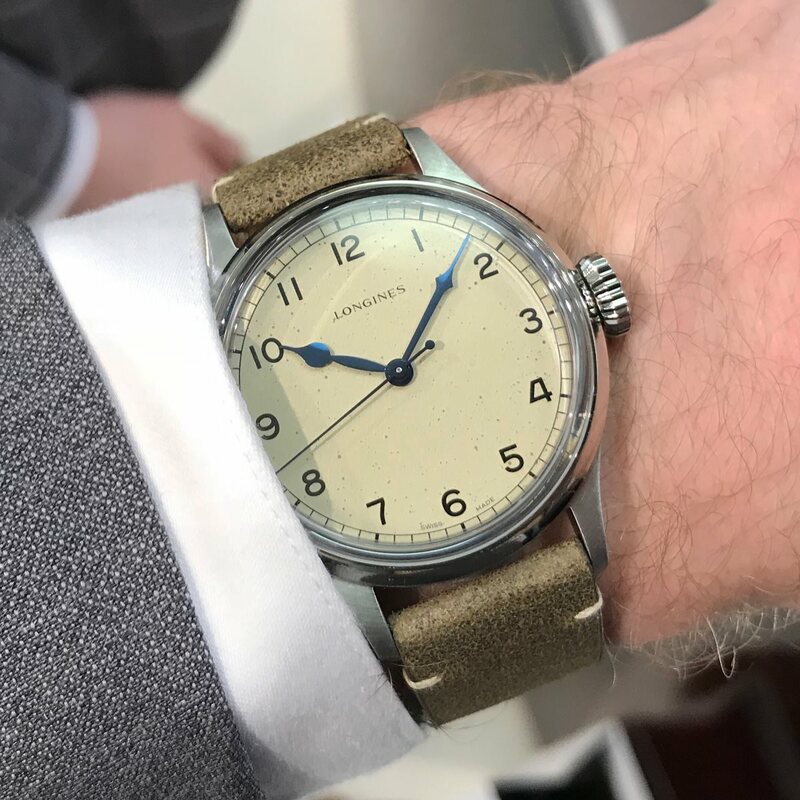 The dial on the Longines Heritage Military Watch has a lovely beige colour to it with a subtle speckle design to it with dark spots scattered across the dial completely randomly, meaning your accurate re-issue from Longines will be as unique as a genuine piece from the 1940’s. This is a fantastic touch from Longines, something that could have easily been ignored without anyone saying anything. This effect alone is something which really helps the piece become a much more accurate re-issue. What makes this piece so special is how accurate it is to a genuine one. Not only do you get some slight faux patina with the dial, but the railroad seconds track remains, those incredible blued hands also stay and Longines decided to go with a slightly old-school style font for their logo. 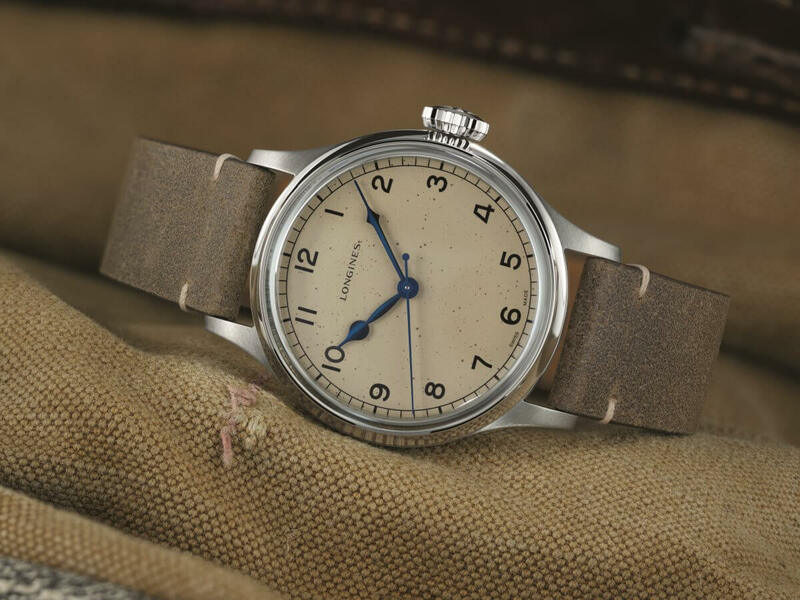 The fact Longines avoided adding 'Automatic' on the dial like many modern releases and even resisted a date window only helps this watch become even more special. 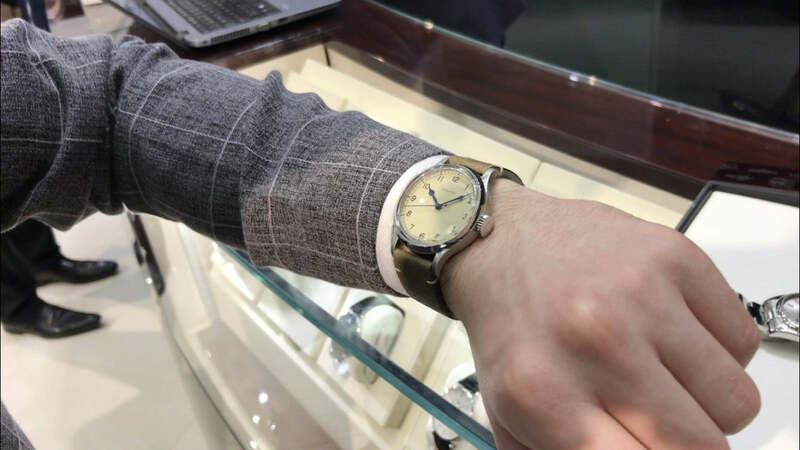 Longines offers a service where anyone with a vintage timepiece can contact the brand and they will research the exact model you have letting you know it’s story, where it was originally bought, what year etc etc. Once you understand this, and get your head around how much information they must have stored, it all starts to make perfect sense as to why this re-issue is such a hit. After holding and wearing the watch at Baselworld 2018 this year, I’m happy to report that the watch wears on the wrist very well. I didn't even know this was possible, but almost too well. So much so once the watch was on my wrist it looked like it was already apart of my collection instantly. The thickness and slim profile of the watch case is spot on, with a mixture of vertically brushed and polished areas giving this vintage re-issue some modern presence on the wrist. This finishing continues to the bezel which is polished with the top of the lugs being brushed. This mixture of finishes across the whole piece is another aspect of the watch that makes it so special. When it comes to straps for the Longines Heritage Military Watch it’s available straight out of the showroom on a lovely beige coloured leather strap andone-piecene piece NATO strap has been rumoured. Both complimenting the watches aesthetic perfectly. I think it would be a sin to not put this watch on anything but something that has a vintage/military connotation. My top picks would be one of our Green Nylon NATO straps, a lovely dark brown handmade in German leather or a strap from our Aviator collection. When it comes to things I don’t like about this release, it’s a hard thing to come up with any serious. For a release with so many positives the only thing that stands out as a form of 'negative' would be the movement used. Although the ETA A31 based L888 automatic movement powering the Longines Heritage Military Watch seems impressive with its incredible power reserve of 65 hours, beating at 25,200 BPM I would have loved to have seen this with a manual wind movement. I think this would have helped with the charm of the piece, the connection between the owner and watch would be heightened plus it would help it feel even more accurate to originals. Saying all that, however, as a business decision, the L888 Automatic movement is a good, solid and strong decision by Longines, so I can forgive them. Longines quite simply nailed this release. In a year where the likes of Omega, Bulova, Rolex, Oris, Breitling and Tudor all released watches that looked back to the past with incredible success, for me, it’s this little old Longines release that Longines themselves haven’t even mentioned that has quite possibly stolen the show for me. 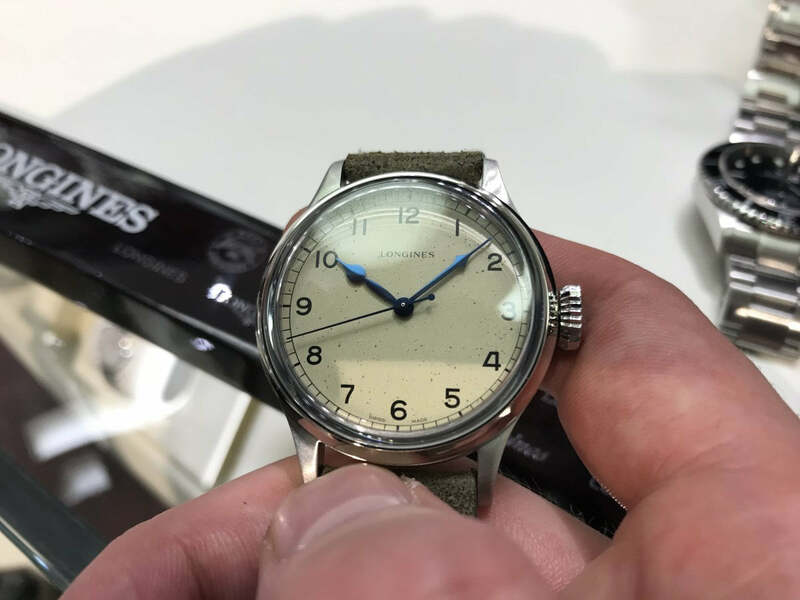 Longines say this release will be available later on in the year, although I have a sneaky suspicious, much like the Heritage 1945 of last year, this will be a lot harder to get your hands on than we might all desire. After a not so short 7 months wait, we finally receive some more information on this great looking watch as well as some official press images. 'In honour of its rich history, Longines has drawn inspiration from a 1940’s watch model to create The Longines Heritage Military. True to the original lines of a timepiece designed for the British Royal Air Force, this sleek, reimagined watch belongs to a timeless style that has made the winged hourglass brand famous. To reproduce the original timekeeper’s patina, the dial on the military watch has been hand sprayed with tiny black droplets, making each and every piece unique. The Longines Heritage Military will be available in early 2019, priced at $2,150 USD. I think it's fair to say, after seeing the official images, it was certainly worth the 7-month wait. Now when I can get more hands-on time? Lovely watch but the aging it just plain stupid and would drive my mad ,it's just like those idiotic jeans with holes in them yuck! 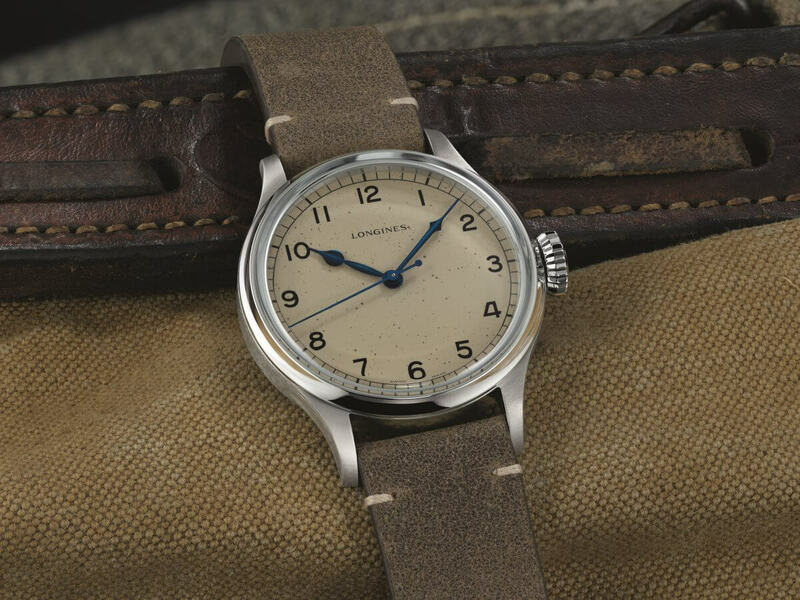 Great piece on the Longines Military Watch. Are you abel to let me know when it will be on the market to purchase & where from? Great to hear you enjoyed! As I mentioned in the article there isn't a lot of information on this piece out there. I believe what I have heard was a rather vague 'later this year'. The best thing to do would be to visit your local Longines official dealer and see if they have any more info. I absolutely love the aesthetic of this watch, but could I please get some information about the price of this watch?